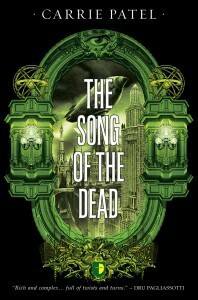 The Song of the Dead is another adventure in Carrie Patel’s Recoletta series. With the signing of an accord, Inspector Malone and her unofficial partner, the laundress Jane, find that they are in a bit of a no-man’s-land as a variety of officials fight for power and control. Arnault is seized and his life is threatened, which motivates Malone into action. But her attempt to rescue Arnault fails and Malone is arrested. Malone and Jane race across the country to protect their world, though they have a difference of opinion on how best to go about it. Patel continues to do a really nice job of world-building as we learn more about why the civilization moved underground and we travel by airship and seaship with Malone and Jane to farther reaches of the world. For me, this is one of those unusual cases where I was not as interested in the story that was going on, but I was interested in reading the story in order to learn more about the world. The history and technology here really drove my desire to keep reading. The story itself is fine. I’ve enjoyed my time with Inspector Malone and Laundress Jane in each of the books. These haven’t been a waste of my time, but at the same time, I haven’t been wondering when the next one would come out. In that sense, these (and this in particular) tend to be just above average fare. Looking for a good book? If you enjoy urban science fiction with a delicious twist of mystery, then you will enjoy Carrie Patel’s The Song of the Dead.